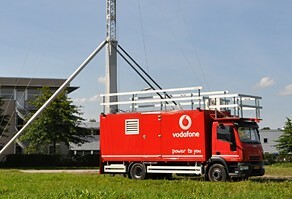 This special vehicle was developed for temporary supporting wireless networks such as TETRA or GSM. This can be during large scale events, disaster areas or the maintenance of sites. The vehicle is equipped with a torsion resistant superstructure that is divided into two main sections; the generator section and the network equipment section. The unit is fully self-supporting and can be equipped with extra large capacity fuel tanks that will enable the generator to work for several days. Many options available please ask for details.